cryotherapy for the removal of warts, skintags and other skin lesions. Sarah holds clinic sessions on Fridays at Platinum Physiotherapy in Coxhoe. 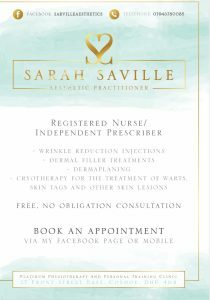 Appointments are required and can be made by telephoning Sarah.